Much like Dr. Chandrashekar Kambar’s other plays, “NayeeKathe” too imbibes North Karnataka’s folk flavor. As the “StoryTeller”’s voice the author inquisitively invokes the question of which is bigger of love and wealth and links that to the life of the semi nomadic community to carry the story forward. People of the suppressed class accept the situations and exploitation as an indivisible part of their lives. The manner in which this class leads an oppressed life by bearing the abnormally high-handed and violent treatment of the wealthy class is presented in an unprecedented fashion by the author. The conflict between the ‘arrogance of the wealthy’, the ‘desire of the commons’ and ‘reality’ along with the struggle for life and the concept of freedom increase the pace of the drama. There is Sommanna, inebriated with power and money, using women as objects of lust. Then there is Aalumaga alias “Naayee” (Dog), so extremely loyal to an extent that he does not even count himself as other humans. 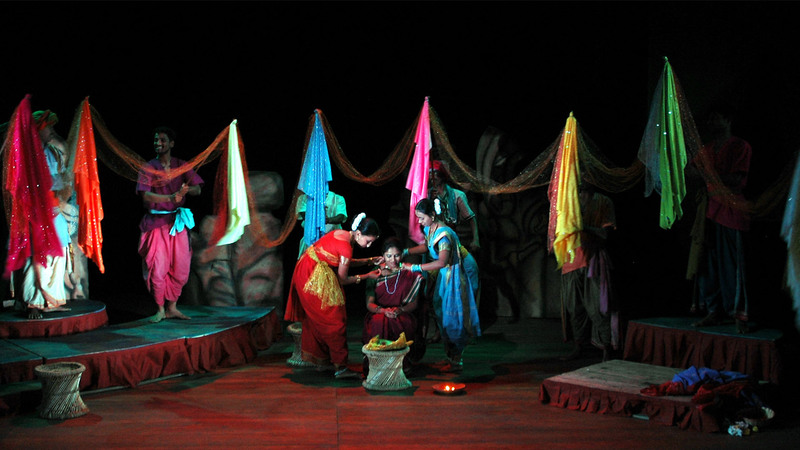 Giving a twist to the story is Sharee, who tries to awaken Aalumaga’s self-esteem by invoking the fountain of love in his barren desert like heart. The manner in which this play exposes life, by holding a satirical mirror to reality & creating a discretionary foreword to knowledge, is wonderful.